It all started back in 1982 where the Björch family’s youngest (a young Susie in her early teens) acquired the wonderful Italian Greyhound MultiCH Bianca (bred by Ruth Broustbo, DK). She captured all hearts, and led the family away from their former devotion for Irish Wolfhounds and Doberman Pinschers. 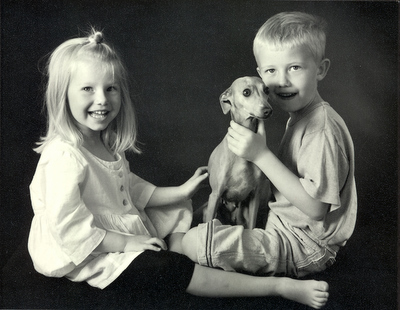 Susie´s mother Birthe also acquired one of this lovable little breed, and a new era for the family’s passion for dogs had begun and a very selective, small scale breeding of Italian Greyhounds under the prefix ”Il Cagnolino” (Italian, meaning ”the small dog”) had started. Raising a litter is an enormous task and responsibility that requires a lot of time and pleasure in doing it. Therefore we can only manage to have a litter with years between. But when deciding to raise a litter it is an event that involves 3 generations of the family. Right from the planning phase and to the puppies can leave home at app. 8-10 weeks of age. When the puppies are born they live the 3 first weeks as quite as possible giving the mother and puppies plenty of peace and quietness. Then from 3 weeks we gradually increase the activities (fx toys that squeak, car driving and every sound that belongs to an active family live) and giving them plenty of human contact by slowly introducing them to adult visitors, the children’s playmates, visitors from the kinder garden and school. We use plenty of time together with the puppies to ensure proper and healthy mentally development. We strive only to have litters during spring/summer time to give them the best possibility to experience the outdoor living while playing in the garden and taken on small trips outside our premises. The Björch family spends a lot of time participating in dog shows at home and abroad. And why is that so important to have the dogs pose, run in a ring and look pretty? In fact dog shows are the breeder’s most important tool in their achievement to breed dogs that are healthy, mentally correct and with the right anatomical construction for an Italian Greyhound. At a dog show each dog is judged and held against the breeds standard (construction, movement as well as mentally) and the breeders work therefore being evaluated. It is a way to preserve each breeds characteristics for future generations. Design: GlobalWebdesign . : Ported to CMSMS :.